Since November, pro-government forces in Iraq have nearly, but not entirely, cleared the country of control by the so-called "Islamic State" (ISIS/ISIL), with the group still reportedly holding out in parts of the western desert. See all this and more on the latest update to PolGeoNow's concise, professional map of control in Iraq's civil war, including a timeline of changes since our previous Iraq map report of November 2017. Up-to-date map of current territorial control in Iraq, color-coded for the Iraqi government, "Islamic State" (ISIS/ISIL) fighters, Kurdistan's Peshmerga forces, and Yezidi militias. Colorblind accessible. Timeline of changes to the situation since the end of November, compiled by our Iraq-Syria specialist, with links to sources. Categories: asia, conflict zones, divided countries, iraq, isis, kurdistan, middle east, premium, rebel control, the "islamic state"
The past month has seen major losses for hardline rebels in Syria's northwest, excluded from the de-escalation agreements, even as the push against the so-called "Islamic State" (ISIS/ISIL) has slowed in the east. 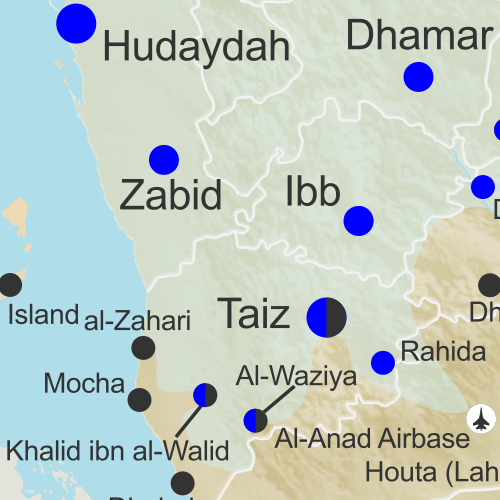 Special symbols indicating towns dominated by rebels of the former Al Qaeda Nusra Front (now Hayat Tahrir al-Sham) and US-backed Syrian Democratic Forces (SDF). 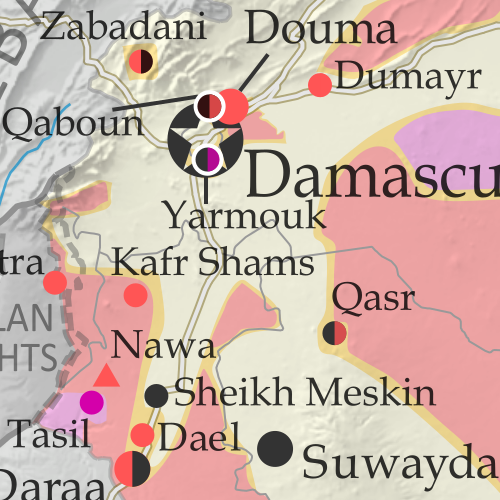 Locations of recent fighting and other important events, including Abu al-Duhur, Beit Jinn, Rahjan, and more. Detailed timeline of important events and changes to territorial control since December 13, 2017, compiled by our Syria-Iraq expert, with links to sources. As opposing forces close in, the so-called "Islamic State" (ISIS/ISIL) has seen its Syrian territory divided into seven different pieces, and you might be surprised where some of them are located. Meanwhile, fighting between the government and rebels continues at a low level. Locations of recent fighting and other important events, including Abu Kamal (Al Bukamal), Quriyah, Rahjan and more. Detailed timeline of important events and changes to territorial control since November 14, 2017, compiled by our Syria-Iraq expert, with links to sources. 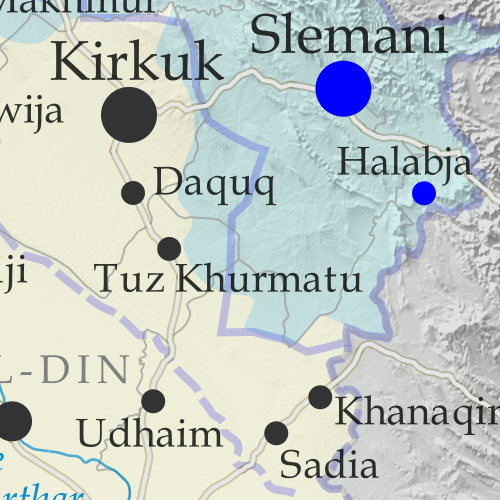 Since mid-October, government forces have recaptured the last towns in Iraq controlled by the so-called "Islamic State" (ISIS/ISIL), even while taking more territory from the Kurdistan Region in the wake of its controversial independence vote. See all this and more on the latest update to PolGeoNow's concise, professional map of control in Iraq's civil war, including a timeline of changes since our previous Iraq map report of October 2017. 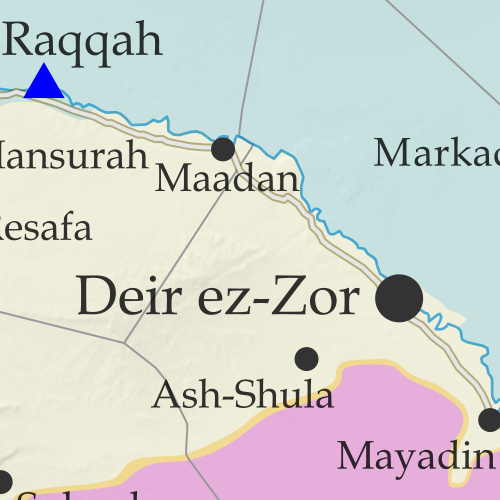 Over the past few weeks, the so-called "Islamic State" (ISIS/ISIL) has been completely driven out of its last major city, Deir ez-Zor, and now only controls a few smaller towns and the surrounding desert. Its enemies, the Russia-backed Syrian government and the US-backed Syrian Democratic Forces (SDF), are both moving in to take its place. Locations of recent fighting and other important events, including Deir ez-Zor, Abu Kamal (Al Bukamal), Markadeh, Quriyah, and more. Detailed timeline of important events and changes to territorial control since October 26, 2017, compiled by our Syria-Iraq expert, with links to sources. In the past month, the so-called "Islamic State" (IS; formerly ISIS/ISIL) has lost its former capital city and other key sites to the US-backed Syrian Democratic Forces (SDF), even as government troops have advanced against it in Deir ez-Zor, Hama, and Homs provinces. 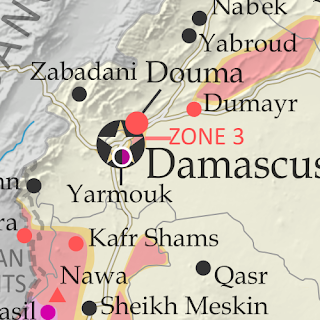 See all this and more on the latest update to PolGeoNow's concise, professional Syrian Civil War control map, which includes a timeline of changes since our previous Syria map report in September, with sources cited. 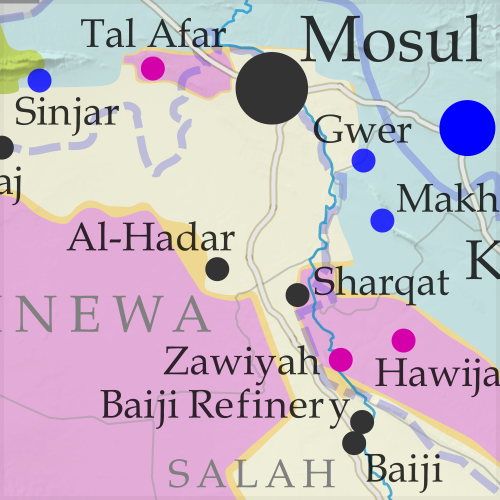 Locations of recent fighting and other important events, including Raqqah, Deir ez-Zor, Mayadin (Mayadeen), As Suwar, the Al Omar oil field, and more. Detailed timeline of important events and changes to territorial control since September 27, 2017, compiled by our Syria-Iraq expert, with links to sources. 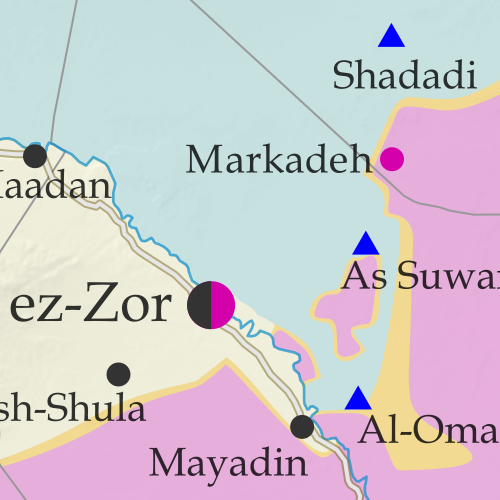 In the past month, the territory of the so-called "Islamic State" (IS; formerly ISIS/ISIL) has continued to shrink rapidly, with the Russia-backed Assad government and the US-backed Syrian Democratic Forces (SDF) both rushing to secure Deir ez-Zor province in Syria's east. 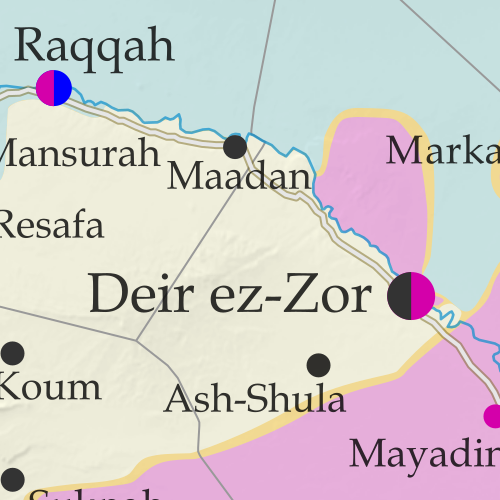 Locations of recent fighting and other important events, including Deir ez-Zor, Maadan, As Suwar, Aqerabat, and more. Detailed timeline of important events and changes to territorial control since August 28, 2017, compiled by our Syria-Iraq expert, with links to sources. Categories: asia, conflict zones, divided countries, isis, kurdistan, lebanon, middle east, premium, rebel control, syria, the "islamic state"
Since our previous Libya control map update in June, the Libyan National Army (LNA), fighting on behalf of the country's eastern government, has completed its years-long campaign to secure control of Benghazi from religious hardline fighters. Meanwhile, with the UN-backed government in Tripoli distracted by fighting with a third faction (the "National Salvation Government", or NSG), the so-called "Islamic State" (IS; formerly ISIS/ISIL) has begun a resurgence in rural areas near its one-time stronghold of Sirte. See all this and more on the latest update to PolGeoNow's concise, professional Libyan Civil War control map, which comes with a timeline of changes since our June 2017 Libya control map report. Up-to-date map of current territorial control in Libya, color-coded for the UN-backed Government of National Accord (GNA), the rival Tobruk parliament and Khalifa Haftar's Libyan National Army (LNA), and the so-called "Islamic State" (ISIS/ISIL). New colors have been added for the Tuareg and Toubou ethnic alliances that control much of the country's far south. Locations of recent fighting and military operations, including Wadi al-Ahmar, Nawfaliya, Benghazi, Sabratha, and more. Detailed timeline of important events and changes to territorial control since June 6, 2017, with links to all sources. In the past month, Iraqi government forces and allies have completed their recapture of Mosul, the third biggest city in Iraq and the largest urban center ever controlled by the so-called "Islamic State" (IS; formerly ISIS/ISIL) in any country. See all this and more on the latest update to PolGeoNow's concise, professional map of control in Iraq's civil war, including a timeline of changes since our previous Iraq map report of June 2017. 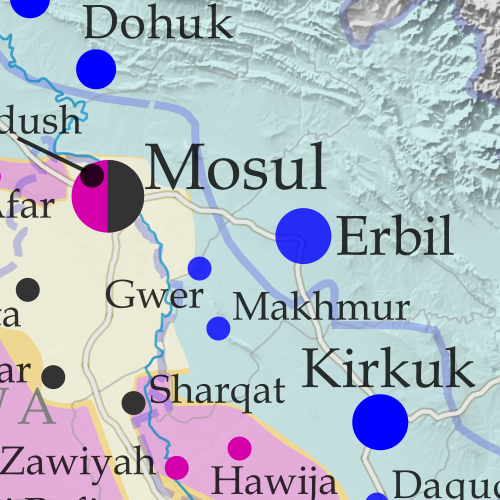 Up-to-date map of current territorial control in Iraq, color-coded for the Iraqi government, "Islamic State" (ISIS/ISIL) fighters, and Kurdistan's Peshmerga forces. Colorblind accessible. New: Separate color for Yezidi militias of the "Sinjar Alliance", who control their own territory near the Syrian border. In the past three months, Iraqi government forces have made slow but steady progress against the so-called "Islamic State" in the city of Mosul, while pro-government militias have pushed westward from the city all the way to the Syrian border. See all this and more on the latest update to PolGeoNow's concise, professional map of control in Iraq's civil war, including a timeline of changes since our previous Iraq map report of March 2017. The past month has seen major changes to control in Libya's interior, as rival governments face off there and in around the capital city of Tripoli. 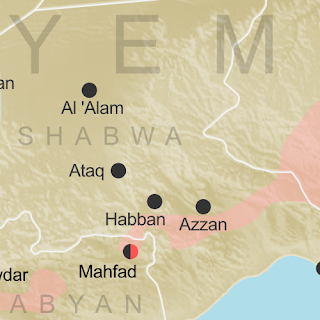 Meanwhile, the so-called "Islamic State" (ISIS/ISIL) has reportedly re-emerged in rural areas near the coast. 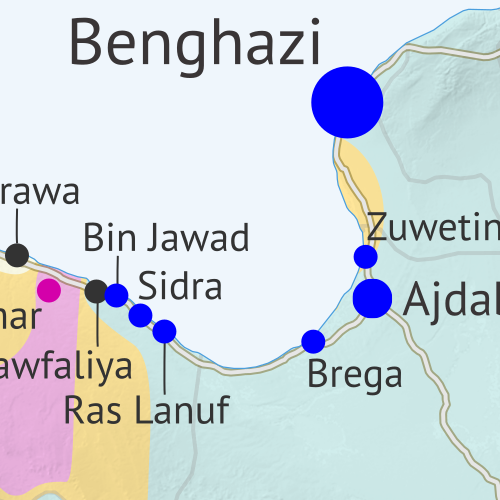 See all this and more on the latest update to PolGeoNow's concise, professional Libyan Civil War control map, which comes with a timeline of changes since our April 2017 Libya control map report. Locations of recent fighting and military operations, including Tamenhint and Jufra airbases, Brak, Sukna, Bani Walid, and more. 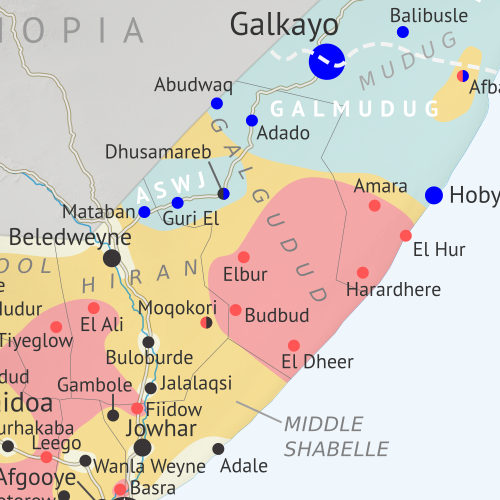 Detailed timeline of important events and changes to territorial control since April 28, 2017, with links to all sources. The past month has seen continued territorial losses for the so-called "Islamic State" (IS; formerly, ISIS/ISIL), as government and rebel forces take vast swaths of desert and a Kurdish-led coalition closes in on the group's capital. 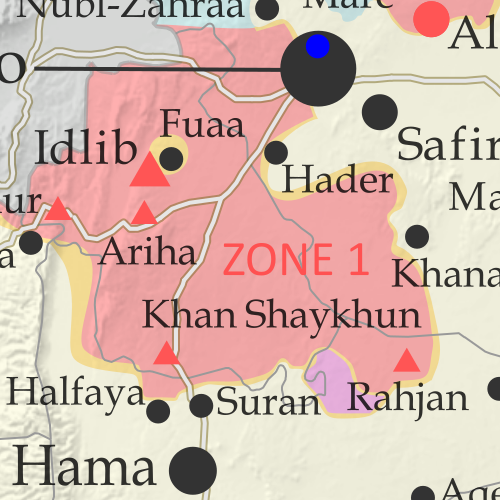 Meanwhile, foreign countries have begun drawing up provisional ceasefire zones along hardened lines between rebel and government control. 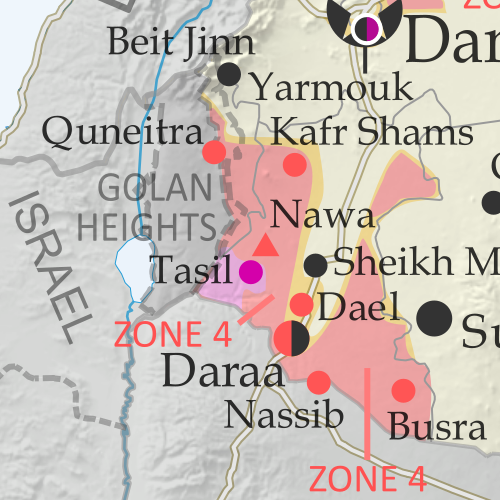 Locations of recent fighting and other important events, including Qaboun, Sawwana, Shaer gas fields, Jirah airbase, and more. Detailed timeline of important events and changes to territorial control since April 26, 2017, compiled by our Syria-Iraq expert, with links to sources. The so-called "Islamic State" (ISIS/ISIL) has continued to lose ground in Syria to the Kurdish-led, US-backed Syrian Democratic Forces (SDF) in the north, and to rebel groups in the southern desert. Meanwhile, the Assad government has made some gains against rebels in Hama province, the Damascus area, and elsewhere. Locations of recent fighting and other important events, including Thawra, Halfaya, Suran, Qaboun, and more. Detailed timeline of important events and changes to territorial control since March 29, 2017, compiled by our Syria-Iraq expert, with links to sources. Advances against the so-called "Islamic State" (ISIS/ISIL) have accelerated from all sides, with Kurdish-led forces nearing the doorstep of the group's capital city. Meanwhile, months of defeats for anti-Assad rebels may have begun to reverse. 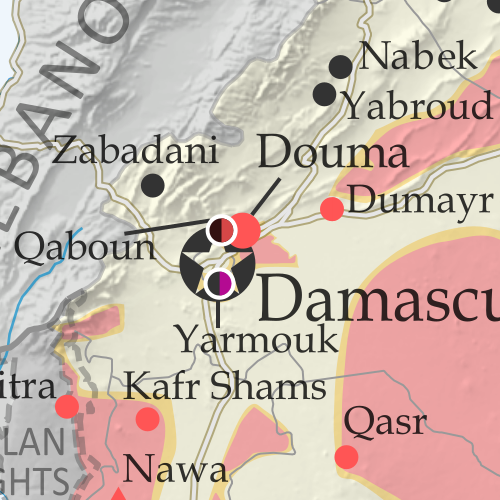 Locations of recent fighting and other important events, including Palmyra, Dayr Hafir, Karama, Qaboun, and more. Detailed timeline of important events and changes to territorial control since February 24, 2017, compiled by our Syria-Iraq expert, with links to sources.